After receiving your final product drawing, Triple-c takes the first essential step towards a plastic product: by designing the mold. The mold is designed in our CAD department. Every product detail is drawn in the mold, just like all parts of the mold, such as sliding, ejectors and cooling. our engineers determines, in consultation with the customer, how and where the product may be sprayed in order to achieve the best result. Analysis programs can be used to determine whether problems can arise during injection molding. In the event of signaling of potential imperfections, the mold design can be pre-adjusted. This way we lay the foundations for a good end result. After completion of the mold design, it is passed on to the manufacturing department. 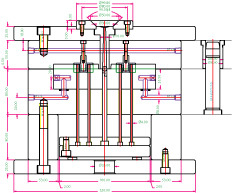 Once we-or you- have finished the part 3D cad engineering we start to design the mold. This process takes 2-3 days.